Have Your Next Event at Grand Slam! We have the space and staff to accommodate any size gathering! With TWO LARGE dining areas we can handle parties of up to 100. In fact, we can accommodate parties of up to 20 to 25 without a reservation – though we do suggest calling ahead . Our Event Planning Staff will work with you to accommodate any type of room set-up and menu your special occasion may require, from a family-style dinner gathering straight from the menu to a full buffet or just stationary hors d’oeurvres, let us take care of all the details – and the dishes, for your next gathering. Whether you need space for a large working lunch, corporate party, birthday or anniversary party. 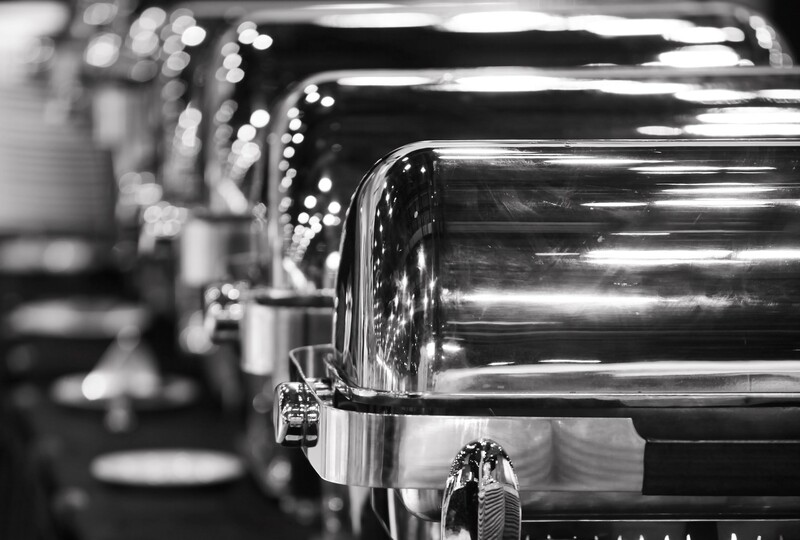 family reunion, graduation parties, wedding rehearsal dinners or wedding receptions, or an after-life celebration we’ll take great care of you and your guests! We also love having local sports teams – adult and youth leagues alike – come in for group dinners after the game or practice, or annual awards banquets! Most parties are hosted in the back dining room. This dining room features a buffet area, dart boards, and a full game room. This room has several large televisions, including a projection TV. Tables are a variety of heights and sizes. There are doors, and sound barrier that can be placed up to cover the open window, and a unisex bathroom. Parties that do not pay the room fee generally get one side of the room or the other, and are given enough space to accommodate your guests adequately. Should you wish to make the room private, you may pay to do so. Please note that our Sunday Brunch goes until 1:30pm each Sunday, so the room is not available to be private until 2pm. If you do not opt for a private room, there is no charge for your reserved space. A set-up fee of $50 applies to all parties that use the Ala Carte Party Menu. Set Up Fees also apply to any party that chooses to greatly rearrange the room for any reason, including bands, karaoke, etcetera. Alternate Spaces include the middle dining room, the patio (when weather permits), and the bar. However, these rooms are better suited to our smaller parties, and will never be options for private parties. We do have blinds that can be lowered, as well as doors that close, for private parties. If you pay the private room charge, you may request for us to also put up a sound barrier on the window cut out. If you do not have a private room, and wish to have room dividers put up, you may request that at a charge of $25. Please note that this request needs to be made no later two (2) days prior to your event. If you request it at the time of your event, it will only be done if we have staffing capable of putting the barriers up. Please note that the boards are heavy, and the waitresses cannot usually do this for you. Last minute room barrier charge is $30. A cake table can be provided free of charge, space permitting, provided the request is made no later than two (2) days prior to your event. If requested at the time of arrival, it may or may not be an option. Our staff is able and willing to help you arrange the tables to your liking; any special requests should be made in advance. If you make drastic changes in the space, we ask that you put the tables back as you found them, or incur an additional charge of $25. Generally, you will have access to the space 1/2 hour prior to your event. In some cases, you may be able to decorate earlier, as business allows. We suggest that you use table cloths and free standing decorations, limited to the space provided for your group. Any balloons must be tied down so that they do not get released into the ceilings of fans. No confetti or glitter. Please ask for permission to attach decorations to the walls or any existing structure. Candles are allowed on cakes only. Any excessive damage or cleaning will result in an additional charge, usually in the amount $50.00. Children and minors are allowed; we do request that you attend to your children at all times. For the sake of safety for your children, our guests, and our staff, we ask that they refrain from running, throwing toys, littering, or standing on equipment or chairs. We also tell our guest that while children are always welcome, we do our best to maintain a family friendly environment until 9:30pm. At that time, we do advise that the language filters are removed from the juke box. Please plan accordingly. Should any minors attempt to partake in illegal activities, in any form (i.e., ordering alcoholic beverages, drinking alcoholic beverages, smoking, gambling, etcetera), they will be asked to leave the premises. This applies to all venue property, inside and out. During most weeks, Grand Slam hires an acoustic band on Wednesdays, Fridays, and Saturdays, and a karaoke DJ on Thursdays. Entertainment is set up in the middle room, and can be heard from the back room and bar as well. Please ask about times and bookings. If you wish to have a band or DJ at other times, you will need to provide, negotiate, and pay for any arrangements on your own behalf. However, you must gain permission of Grand Slam management before booking any persons or groups. Management has the right to refuse any performers for any reason. Please note that smoking is not permitted inside the building. Smokers may enjoy cigarettes and electronic cigarette devices on either patio; we do feature an outside patio as well as an enclosed patio that has heating and cooling. Please refrain from smoking or vaping anywhere in our building. Cigars are allowed on the outside patio only. Ideal for the party where all guests are expected to eat. We offer various buffets, including appetizer, lunch or dinner. Unlimited buffets are generally served for a two (2) hour period for a set dollar amount per person. This amount applies to all people that are in attendance, not just those who are eating from the buffet. When you first book, we will ask for an estimated number of people so that we can plan accordingly. As we near the date of your party, you will be asked for a guarantee number of people for your party. You will pay for that number, even if you have less attendees, as we will have prepared food for that number of people. While we do allow for a few extra guests, please note that a large influx in the number of attendees can create problems, so do your best to reach an accurate count. If you do have a large influx, we reserve the right to change your menu, and food may take longer to come to the buffet. Please Note: All attendees present during the time slot when food is presented will be included in your buffet count; our staff cannot be expected to watch who eats and who does not. Ideal for the party where guests come and go, or not everyone is expected to eat. Since many families choose to have Grand Slam food for their events, we have larger quantities and trays available. This option is the best fit for parties who plan to have waves of people coming through, or who aren’t intending to feed guests a meal, but would still like to have some food available. Our base menu is just that – a base. It offers many of our most popular options. Prices are based as a To Go option – meaning that the customer orders, food is set up in to go packaging, and picked up at our business. You may choose to set up a buffet at Grand Slam with these items; doing so will incur a $50 set up fee. We can waive the set up fee if you choose to forgo the buffet option. In this case, these items will be placed on tables, family style. We’re sorry, but all items will need to come out as they are ordered. IE, you may order two (2) pans of toasted ravioli out at separate times, but please do not expect us to break this into four (4) separate times. If this is your need, order multiple orders of ½ pans out throughout the night. For the group who are all on individual tabs, limited menu may work best. See our staff for the most current version of a limited menu. Limited menu may be required for parties over 25. Please note that we cannot guarantee that all meals will come out at the same time. In an effort to ensure the highest food quality, each meal may come out as it is ready. If it is important to have everyone eat at the same time, please choose a buffet. Additionally, please note that we staff according to the guarantee number given to us days before arrival. If your group grows more than 10%, this can and will put added constraints on availability of items, as well as timing of food coming out. Intended for smaller groups, or for parties that may trickle in and out, and not all plan to eat at the same time. A group could also choose to order some pizzas, wings, and appetizers off the menu, served standard tableside manner. Please be aware that the bigger your group is, the less likely that your food will all come out at the same time. Placing your deposit secures your space. Parties are confirmed on a first-paid basis. This means that if you have spoken with us about a party, and have not put down a deposit, it is possible for another party to book over you. Please note that we cannot start preparing food until a deposit is made, or your party host has arrived. For those securing space, not requesting a private room, the deposit is $100 and will be applied to the bill the day of the event. For those booking a private party, the deposit is the cost of that room fee (please see schedule of fees on page 2). This pays for the space itself. This deposit can be made in person or over the phone. Please make arrangements with Patrice to make this deposit.